Intensely moved by the strictly limited edition, rally-derived GRMN version of Toyota’s popular Yaris, Iain Robertson longed for more sporting commitment from Japan’s top carmaker, which makes the addition of GR Sport to the range so perfect. For so long, Toyota has managed to hide its sporting light beneath a particularly sizeable bushel. Despite winning several Drivers’ and Teams’ World Championships over recent decades, the results were only ever reflected subtly in the company’s retail offering. Oh, sure, there was a road-going version of the Celica rally car of the 1980s and the firm offered GTi versions of its Corolla in both front and rear-wheel drive variants but there was no shouting from the rooftops and the bulk of its immense worldwide sales was in boringly dependable mainstream territory, with zero appeal to enthusiasts. Some car manufacturers seem to have ‘hot’ blood running through their veins, Ford and Renault being prime examples. In the former case, having established the RS line in the 1970s, Ford is never shy about its sporting prowess and the hottest versions of its Fiesta and Focus bubble somewhere close to the surface of its marketing. Renault has performed similarly with its RenaultSport offerings that are unashamedly compromised, yet overtly sporting. Both brands have created pinnacle models over the years and successive redesigns. Meanwhile, others dabble on the peripheries. Yet, Toyota, a company that is revitalised in recent times, has combined its long-term attributes of reliability and conservatism, with a new-found (but innate) sporting capability. 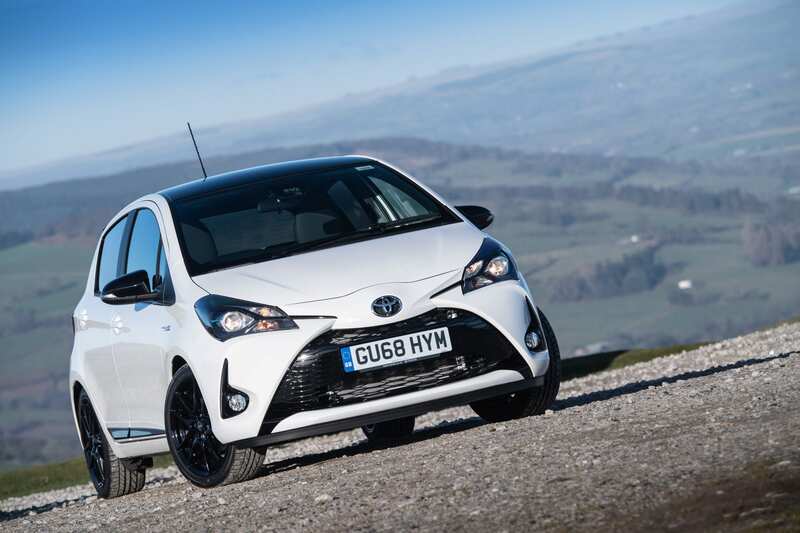 Inspired by the strictly limited Yaris GRMN performance hatchback, the latest Yaris GR Sport heralds that greater sporting style and handling prowess in Toyota’s supermini range, as an understandable extension of the firm’s motorsports successes, achieved by Toyota Gazoo Racing. Toyota deserves to ride the crest of a wave following outright victory in both the Le Mans 24 Hours endurance race and by lifting the World Rally Championship manufacturers’ crown in 2018. In a way that it has ‘ignored’ that sporting edge studiously in recent years, those successes are now feeding into a new generation of enticing road-going cars. Good on you, Toyota! 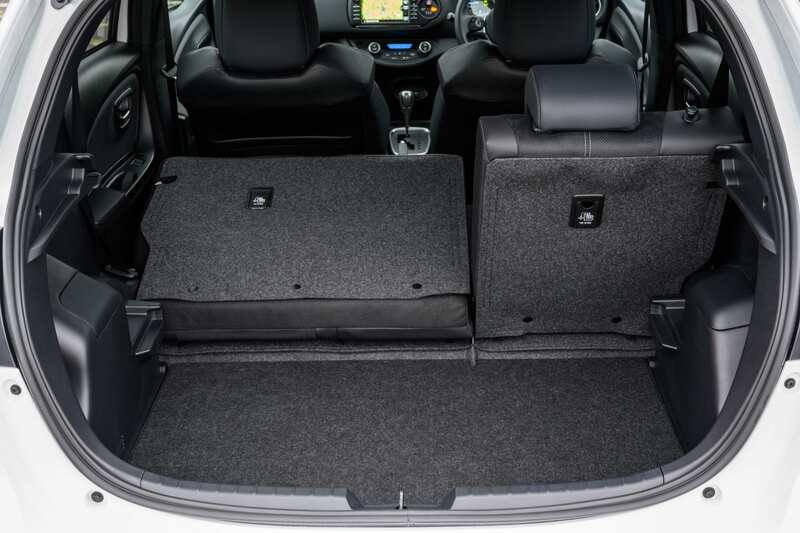 On the Yaris, the modifications are focused pertinently on the suspension, to provide the car with engaging handling and responsiveness, which is actually far more sensible than bags of extra power. I make no apology for falling head-over-heels in love with the highly focused GRMN model (the full test report of which is in our archive). What a machine! Yet, as with any specialised model, loving it and living with it are two quite different aspects. This type of car, which is used, in homologation terms, to allow a manufacturer to enter the realms of different classes of motorsport, can be very demanding on its owner. Beefed-up suspension, ‘flat-shift’ gearboxes and super-resilient handling are not always conducive to those occasions, when a ‘pleasant drive in the country’ might be the desired option. The GR Sport, on the other hand, uses Sachs Performance shock absorbers, similar to those fitted to the GRMN model, with slightly softer but no less gamey settings, and a solid (rather than hollow) anti-roll bar to gain extra rigidity. The car has a sporting stance, with suspension lowered by 15mm and the body sitting 9mm closer to the road surface. It might not seem like much but it gifts the Yaris the roll-free stiction and preferable balance of a true sporting hatchback. Its handling is precise but comfortable. Its responses to driver input are instantaneous but (thankfully) lack the feral quality of the GRMN. Black 17.0-inch diameter cast alloy wheels are exclusive to the GR Sport, but are fitted with the same, very grippy Bridgestone Potenza RE50 205/45R17 tyres as the GRMN model. Thanks to surgically crisp steering, the turn-in and manoeuvrability of the Yaris are as loyal and pure as any press-on driver could demand. 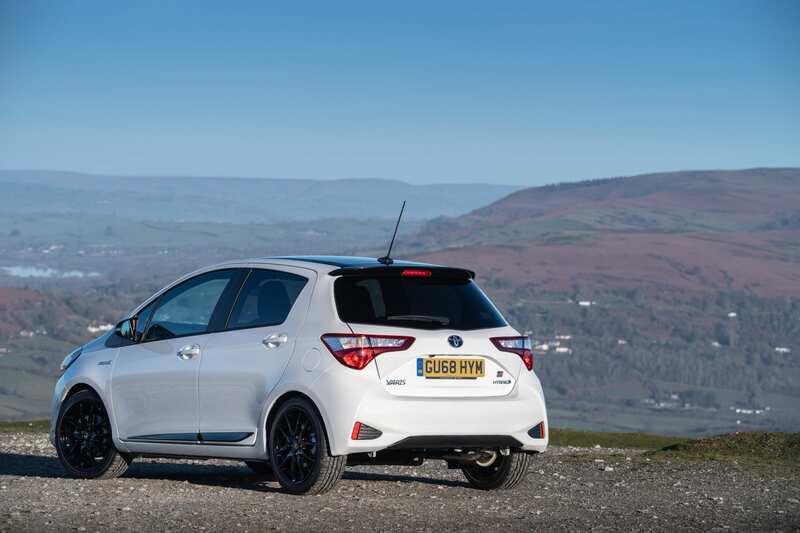 The exterior styling follows the lead of the Yaris GRMN, including a black bi-tone roof with rear spoiler. There are piano black door mouldings, a black honeycomb grille, black door mirror housings and black front fog light surrounds. The headlights are unique to the GR Sport, with black interior detailing. Dark-tinted rear privacy glass is also fitted as standard, together with GR badging. Optional red decals can be added to the front lip and the top line of the lower rear bumper to generate the extra sporty visual appeal of the GRMN. In the cabin, the sporting character is abundantly clear in the supportively bolstered and GR-branded sports seats, complete with Ultrasuede seatbacks and cushions that provide extra back and bottom grip for occupants, when indulging in GR Sport’s delightfully honed handling envelope. 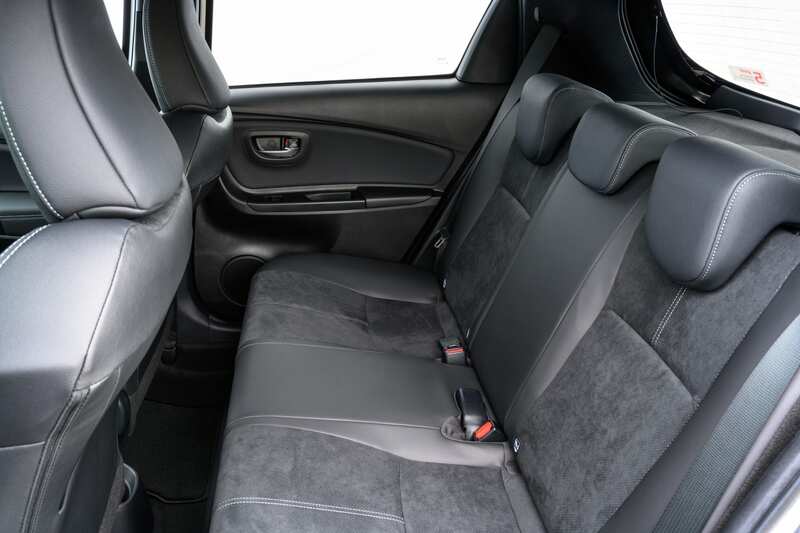 It is a good package, because the fully rake and reach adjustable steering column, allied to the multi-adjustability of the driver’s seat, works well in a surprisingly roomy environment, considering the relatively small footprint of the car. 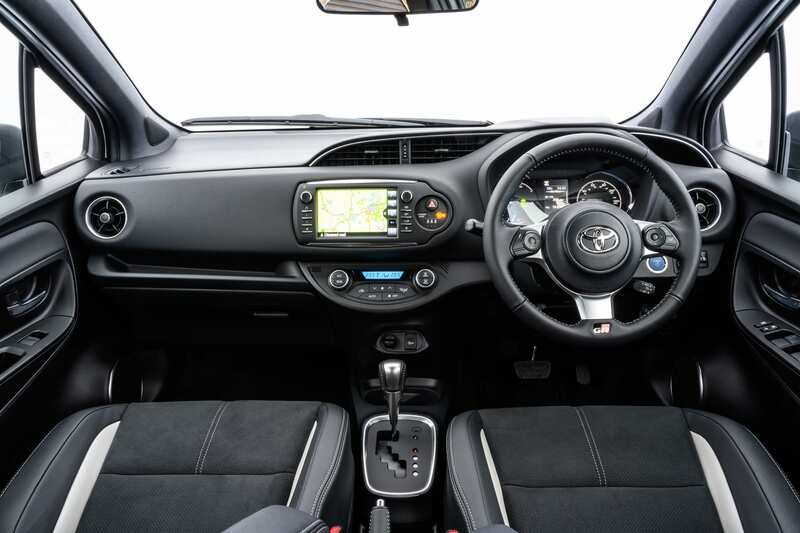 The small-diameter, three-spoke, hide-wrapped steering wheel is the same as the tiller fitted to the Toyota GT86 coupe and there is a black headlining for more sporting appeal. Every journey begins with a GR animation on the TFT multi-information display, when the engine is started. The black floor mats carry the GR logo as well and feature contrasting silver piping. Available exclusively as a five-door hatchback, the GR Sport is powered by Yaris’s stock 1.5-litre self-charging petrol-hybrid powertrain, which provides the best of both worlds. While its EV mode is limited to around a mile of pure electric travel, it provides a valuable acceleration boost (0-60mph in 11.5s) en-route to a top speed of around 105mph. However, if an 85.6mpg potential is desired, this is the obverse side of the GR Sport’s stylistically appropriate coin. It ain’t no rally car but you can revel in its fine dynamic balance, while appreciating that it is not eating you out of house and home. Protection by a five years/100,000-miles warranty reflects Toyota’s fully-justified confidence. Conclusion: List priced at £19,835 (prior to dealer discounts being applied), the exceedingly competent and exceptionally frugal Yaris GR Sport flies a vital hybrid flag for Toyota, with a deliciously enticing sporty edge.